I am often asked, “What mattress and pillow should I use?” The answer is “whatever feels comfortable”, with a few provisos. Some people spend thousands of dollars on a new mattress in an attempt to alleviate the spinal pain they experience during the night, or after they wake up. Unfortunately, they do this before they see a chiropractor. In many cases the new mattress doesn’t make any difference to how they feel while they are in bed or after they get up, because the old mattress wasn’t the problem – the person’s spine was the problem. 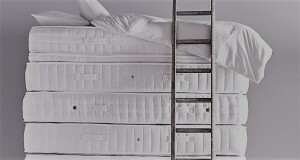 Often, as the person’s spinal health improves, the same uncomfortable mattress miraculously becomes comfortable again! However, when your spinal pain has improved under chiropractic care and your mattress is still uncomfortable, then it may be time to replace the old one. Having said that, even if you don’t suffer from any spinal discomfort from sleeping on a mattress that is old and sagging in the middle, you may need a new one. Your spine is under enough stress during your waking hours; it certainly doesn’t need to be under stress while you are sleeping as well. When you are looking for a mattress to buy, you tend to get what you pay for, but the most important thing is that it must be comfortable for you to lay on. The same thing applies to pillows. They must be comfortable, and the only way to find that out is to try them. I have several pillows in a cupboard at home that I couldn’t sleep on once I’d brought them home from the shop. Ideally a pillow should support your head and neck in a relatively neutral position, that is, the same position as if you were standing. The appropriate thickness will depend in your build and favourite sleeping position (e.g., sleeping on your back or side). Importantly, be sure to see your Canberra chiropractor for any neck pain you think might be arising from your pillow so that any underlying problem can be corrected.